Sweet, resinous woods - smouldering with a heady trail of smoke from the cinders. This evocative and incomparable scent has been loved throughout the Orient and India for millennia. Originally created to help our customers find the same high-quality, all-natural scents their aromatherapy professionals prescribed, advised or used themselves. This latest evolution combines 12 new fragrances with all we've learned over the last 30 years as well as the latest developments in home-fragrance engineering - from self-extinguishing wicks to Coreless CleanBurn technology (consistent fragrance throw and superior burn without tunnelling). 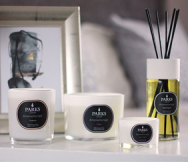 Each and every fragrance has been optimised for our proprietary blend of100% natural wax candles and alcohol-free diffusers.